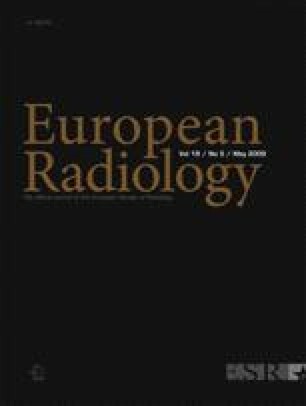 This study compares MRI and MDCT for endoleak detection after endovascular repair of abdominal aortic aneurysms (EVAR). Forty-three patients with previous EVAR underwent both MRI (2D T1-FFE unenhanced and contrast-enhanced; 3D triphasic contrast-enhanced) and 16-slice MDCT (unenhanced and biphasic contrast-enhanced) within 1 week of each other for endoleak detection. MRI was performed by using a high-relaxivity contrast medium (gadobenate dimeglumine, MultiHance®). Two blinded, independent observers evaluated MRI and MDCT separately. Consensus reading of MRI and MDCT studies was defined as reference standard. Sensitivity, specificity, and accuracy were calculated and Cohen’s k statistics were used to estimate agreement between readers. Twenty endoleaks were detected in 18 patients at consensus reading (12 type II and 8 indeterminate endoleaks). Sensitivity, specificity, and accuracy for endoleak detection were 100%, 92%, and 96%, respectively, for reader 1 (95%, 81%, 87% for reader 2) for MRI and 55%, 100%, and 80% for reader 1 (60%, 100%, 82% for reader 2) for MDCT. Interobserver agreement was excellent for MDCT (k = 0.96) and good for MRI (k = 0.81). MRI with the use of a high-relaxivity contrast agent is significantly superior in the detection of endoleaks after EVAR compared with MDCT. MRI may therefore become the preferred technique for patient follow-up after EVAR. Rolf Wyttenbach, MD, is supported by a grant from the Swiss Heart Foundation. We thank Paolo Santini, RT, and the team of MRI technicians for their collaboration and support.